Ever wondered about the stories that inspired your favourite author to become a writer themselves? Want to know the books that turned them into a reader as well as the ones that continue to do so? The Pleasure of Reading is a delightful and revealing collection, edited by Antonia Fraser and featuring over forty acclaimed writers from all corners of the globe and in a period spanning seventy six years, all of whom are bound by their shared passion for reading, including Margaret Atwood, Carol Ann Duffy, Simon Gray, Alan Hollinghurst, Doris Lessing, Roger McGough and patrons of The Reader Organisation A.S. Byatt and Jeanette Winterson. “It started with a bear, and a boy in search of his shadow. Winnie-the-Pooh and Peter Pan were the twin companions of my earliest memories (an animal and a child – this has a certain symmetry; in my un-reading life, the primary companions of those days were an Alsatian called Dusty, and my sister). Of the two, it was Peter who lodged himself most deeply in my heart, making me dream of adventurers who would dart in through the open window at night and fly me away to Neverland. In the world of J. M. Barrie parents are understandably wary of Peter and his home ‘second to the right and straight on to morning’ but in my world it was my mother who pointed out to me that Neverland was just off the coast of Karachi, located on a series of small islets, known as Oyster Rocks by the unknowing; that two of the islets looked like granite sentinels made her claim seem all the more plausible. So although Peter might fly into rooms in London he ended up just off the coast on which I lived; a comforting thought. Royalties from the book will go to Give A Book, who seek to get books into the places where they will be of most benefit. Give A Book work in conjunction with Age UK and Maggie’s Centres as well as other literacy projects, and have supported several of our shared reading groups in London with the donation of new book sets – much to the enjoyment of our readers. For more information about The Pleasure of Reading, see Bloomsbury Books website. The debate on books in prisons is still a burning issue since months after the announcement of rules to ban prisoners from receiving books through the post. A petition to get the ban overturned – supported by The Reader Organisation – has received over 28,000 signatures, and there have been various campaigns, including the very active #booksforprisoners hashtag on Twitter which highlights the reformative power of literature. 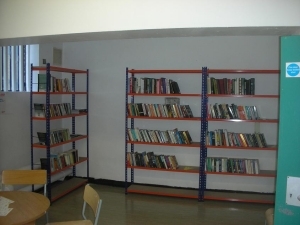 Our friends from Give A Book, who facilitate the gifting of books to charities, organisations and people who need them the most, have recently set up a new Book Room in HMP Wormwood Scrubs. The room is designed to support the existing library within the prison, encouraging prisoners to read recreationally in an informal setting. The Book Room has proved immensely popular since its opening, with an influx of donations of great literature from sources including Granta, English PEN and Cambridge Literary Festival. There has also been some great feedback from the prisoners on the wing, which you can read on the Give A Book blog. There are plans to open a Book Room on all wings of the prison, and it’s a fantastic initiative which The Reader Organisation wholeheartedly supports. Congratulations to all at Give A Book for the success of the Book Room and best of luck for it continuing! You’ll also find more about the subject of books in prisons in Issue 54 of The Reader magazine, which is out now. Writer and patron of The Reader Organisation Erwin James writes about how the power of a good book gave shape to a profound dream he had while he was in prison, and this issue’s interview is with campaigning barrister and director of Just for Kids Law Shauneen Lambe, who speaks about her work with prisoners on death row in Louisiana.